Secretary of State John Kerry was recently spotted at the Shannon airport transit lounge. As his plane took on fuel the American Secretary of State visited the Duty Free shops, wondered about and sat alone talking on the phone while apparently checking emails on another device. since JFK. At its peak (1945 – 1965) the airport became well-known for providing the gateway between Europe and the Americas. Limitations of the operating range of aircraft at the time (DC4, DC6, and Lockheed Constellation 749) necessitated the interruptions of journeys for refueling. Shannon became the most convenient and obvious point before and after the flight across the Atlantic. Celebs, politicians and movie stars have passed through Shannon, including Bob Hope, Bing Crosby, Marilyn Monroe, Gene Kelly and Marlon Brando. Cuban dictator Fidel Castro was a regular at Sheridan bar where he mixed his own version of Irish Coffee. The famed Irish drink originated nearby, at the flying boats base in Foynes on the Shannon River Estuary. One night In 1942, the pilot of a New York bound flight, decided to turn back after several hours battling a severe winter storm. Joe Sheridan, the young Irish chef who managed the base restaurant prepared a new special drink to warm the cold and tired passengers. 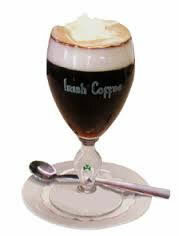 He brewed a dark rich coffee, added Irish whiskey, a little brown sugar and topped it off with freshly whipped cream. The drink was a hit, when asked if he used Brazilian coffee Joe gave a quick answer, ‘No, it’s Irish Coffee’. The rest is history, the drink became a staple at the restaurant and its fame extended worldwide as transiting passengers spread the word – which led to another Shannon first, the Duty Free shop. In 1945 the era of the flying boats was over. A new airport was opened on the other side of the Shannon Estuary for land based planes – Shannon International Airport. Joe Sheridan took his famous drink to the new airport. There, he made sure that new arrivals had the opportunity to enjoy Irish coffee. Not letting a good business opportunity slip by, the enterprising Irish opened the world’s first Duty Free shop in 1951. Sales were brisk as returning passengers stocked up on the main ingredient in their favorite coffee. Irish whiskey distillers have been indebted to Joe Sheridan and the Duty Free shop ever since. THE SHANNON SHUFFLE. photo Lawrence Driscoll collection.